Do your eyes feel swollen, itchy or watery? If so, you might want to book an appointment with your eye doctor to have your eyes examined. Although many people automatically attribute their discomfort to allergies, it’s important to leave the diagnosis to a trained professional that is knowledgeable about eye health. Often, the true cause of a person’s eye irritation is an eye infection. Eye infections are extremely common and can affect any part of the eye — from the eyelids to the retinas. While there are many different types of infections that can affect our eyes, each one can be categorized as fungal, bacterial or viral. Eye infections can range from pink eye (conjunctivitis), the inflammation of the outermost layer of the eye, to blepharitis, an inflammation of the eyelid that is often associated with an infection. What Can Cause an Eye Infection? Contact lenses are an excellent alternative to eyeglasses, but they can also cause infections if you do not maintain a strict hygiene routine. This is because contact lenses restrict the amount of oxygen that reaches your corneas, transforming the eye area into a potential breeding ground for bacterial or fungal buildup. However, practicing good ocular hygiene habits helps ensure that your eyes receive a sufficient amount of oxygen, bolstering their ability to stave off infection. Washing your hands before placing a contact lens on your eye. Removing your contacts immediately if one (or both) of your eyes becomes red or irritated. Always disposing used lenses into the garbage, if you use daily-wear contact lenses. Do not reuse them. 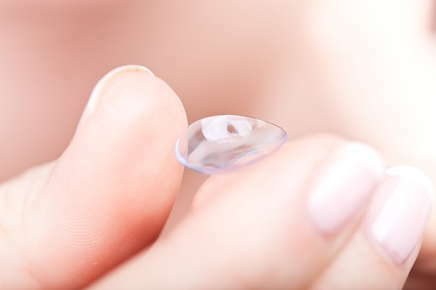 Always placing weekly- or monthly-use contact lenses in contact lens solution for the recommended amount of time, to remove bacteria from the lens. Once their allotted time is up, dispose them immediately and replace them with a fresh set. Another potential cause of infection is using old or borrowed makeup. While keeping your old mascara can save you money, it can also increase your chance of getting an eye infection. Human eyelashes naturally have bacteria on them, which are transferred into your mascara tube with each use. Using old mascara from a tube that has been sitting for a long period of time increases your chance of getting an eye infection, because very little oxygen has been introduced into the old tube over time, contributing to the potential buildup of bacteria. Borrowing someone else’s makeup can also transfer bacteria. That is why, in addition to replacing old makeup within a reasonable time frame, it is highly recommended that individuals refrain from sharing makeup. Replace old makeup within the manufacturer’s recommended time frame. Avoid sharing any of your cosmetics with friends or family. Always wash your hands before applying makeup on or around the eye. Avoid using sample products at any retail location. Many individuals apply these cosmetics directly on their face, increasing the risk of spreading bacteria. If you suffer from eye irritation, discuss the problem with your eye doctor right away. Your physician can treat your eye condition as well as share additional ways to prevent future eye infections.